As some of you know, I am off to China tomorrow. So, as a special treat, we are having two Wright's Writing Corner's this week! This second one is from author Joshua Palmatier, who also writes as Benjamin Tate, whose new book, Leaves of Flame, has just been released! One of the things I harp about (and have done multiple blogs about) are details. Details make or break whether or not a world in a fantasy novel works for me. You need to take your world and your cultures and tweak them with details in order to make that world your own, to give your world depth and to make it come alive. And while all of that’s true, you ALSO have to incorporate those details into your writing in such a way that they aren’t intrusive and that they aren’t info-dumpy. There are many different techniques for this, of course, but the one that I’ve found most effective is to work the details into scenes who have a complete other purpose. After all, in real life, we don’t just sit down and have a conversation with someone and do nothing during that conversation except talk. We often talk while we’re doing something else! That something else could be a minor detail about the world that’s important to the characters, that’s part of their everyday life, but that isn’t necessary for the overall plot of the book. It CAN, however, deepen the setting and the characterization. 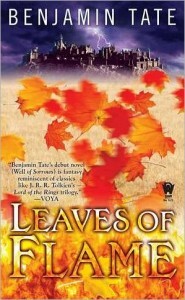 For example, in my current series—started with Well of Sorrows and continuing with the just-released Leaves of Flame—I have a race called the Alvritshai and, within that culture, a religion group called the Order of Aielan who worship a figure named Aielan who they believe manifests in the real world as a magical white flame. This flame is one of the magical components of my world. Some of my main characters are acolytes of Aielan, so their religion is a major component of their character. So how do I get this across without actually just stating that fact? I try to work it into their everyday lives, so that when we interact with those characters, the reader sees their belief in action. So, let’s say one of my characters wishes to talk to, oh, Siobhaen. Rather than have them run into her in a hallway somewhere and start the conversation, I’d have them find Siobhaen in the sanctuary of the local temple, kneeling before the basin that contains—during rituals—the white flames representing Aielan. When they see Siobhaen, they hesitate, since she’s obviously praying, but their news is important enough for them to interrupt, so they eventually cough to catch Siobhaen’s attention. She raises her head, frowns perhaps, and then continues to pray, ignoring the character who has arrived for a significant moment—long enough to make her point. Then, she reaches forward to wipe her finger in the soot left over from the last ritual that rings the basin and smudges it next to her left eye before rising to speak to her visitor. Obviously, in that scene, the important information that will move the plot along comes AFTER all of that, but I’ve taken the opportunity to work in those small details—the basin to Aielan, the smudge of soot—that expand the reader’s understanding of what it means to worship Aielan AND I’ve emphasized how important Aielan is in Siobhaen’s life. I’ve added character development and worldbuilding into a scene that could have happened just as easily in a hallway. But it didn’t, and the consequences are that the world, and Siobhaen herself, feels more real to the reader. So when you’re writing that next scene, ask yourself what you can add to it, what minor little everyday-life detail—pouring a cup of tea to drink (what kind of tea? from where? ), embroidering a shirt (what details are being added? what do they signify? ), eating an orange (where did it come from? is it local and cheap, or from a distant land and expensive? )—you can add to the scene to give it more depth and your world more life. Those details matter, and when taken into account in every scene throughout and entire book, they have a major impact. January 6, 2012 in Wright's Writing Corner.